Beginning in 2007, RFD CDC, a 501.c.3 affiliated ministry of the WNCC, was tasked with finding effective interventions for rural churches and communities in Western North Carolina. Contemporary initiatives with benevolent and educational intent were adopted. Five years of practice provided tremendous insights into the value of good-hearted intentions and education. In 2012, a national conversation took place between practitioners of poverty initiatives that formed the seed for an initiative that was based upon love of neighbor that would foster reciprocal well-being for individuals and communities. In early 2015, 19 persons from seven states gathered in Atlanta, Georgia to establish core values and a strategy for launching a movement that would be transformational. In April 2015, NETworX, an initiative of RFD CDC, was officially launched. Currently, 15 communities across North Carolina are joined with sites in CA, NV, PA, SC, and TX to restore well-being and abundance. 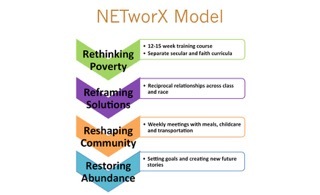 The NETworX model combines best practices from many sources to address the complex process of building relationships across socioeconomic class lines. Practices gleaned from Circles® USA, NC Circles® Plus, asset-based community development and strength-based assessment have been applied. Also, research-based material informed the development of the NETworX model. NETworX takes a unique approach to measurably reducing poverty by approaching the challenge holistically. The strategy is not well-doing for others but rather creating well-being together. In NETworX, individuals and communities work together, choosing to build relationships through education and love of neighbor as well as love of self. The NETworX curriculum helps participants change the way they look at and experience poverty. Traditional definitions of poverty that focus on the lack of material and financial resources are challenged. Participants are asked during a 15-week program to re-think and re-frame their assumptions, then re-shape, and re-store an environment of abundance to replace current efforts of rescue and relief. Content is learner-centered and specific measurable knowledge, skill, attitude, and process objectives are identified. NETworX curriculum developers applied adult learning theory to ensure the material is useful, relevant, and can be implemented immediately. Interactive methods such as peer learning, group discussion, simulations, activities, contemporary movie clips, and storytelling are used. And, guided reflection through journal writing fosters self-evaluation and an opportunity to capture ideas for review later. The NETworX curriculum is designed for both Champions of Change and Allies. Effective use of the curriculum requires an engaging, safe, and respectful learning community where everyone has an opportunity to share. Stories play an integral role in our lives and NETworX. Stories offer us ways to "make sense" of experience. NETworX helps participants understand the importance of knowing their story, assessing its impact on their experience and recognizing the factors that have influenced it. Then, it provides the tools and structure for re-writing a future story of personal and community abundance. At the model's core are weekly meetings that include shared meals, time for relationship-building and mutual accountability, goal setting, and celebration. Childcare and transportation, frequent barriers to regular participation, are provided as needed without cost. Training classes include education around foundational issues of self-awareness, holistic poverty, resources, the role of trauma, and community change. Relationships built over time are central and are supported by trained paraprofessionals. Increase in perception of overall quality of life. RFD CDC assists communities in implementing NETworX through training and coaching.